Lily the tiny 4-pound red smooth doxie rescue continues to do well in our foster care. Her personality is starting to shine through and she doesn’t seem to be overly shy or timid. She is not obnoxiously bold and brave, but she does demonstrate a healthy confidence and maintains her own when rough housing with Emily. All doxies in my house continue to show our alpha doxie Rufus loads of respect and space, so she’s also smart. Dachshund Rescue and Placement continues to search for Lily’s forever family. Permanently placing a puppy is challenging because many rescues look for some very specific things: 1) Is there a stay-home human to train her and be with her during these first formative months? 2) Is there another young dog or dachshund for the new puppy to play with OR is the human family in question very active and planning to include Lily in their daily adventures? Those are just a few from the laundry list. Sadly sometimes folks fail to realize raising a puppy requires more work than adopting a 1 or 2-year-old doxie (though I assert they require lots of attention and love also but on a different level). Being perfectly frank, having a puppy means you kind of put your life on hold for next 30-60 days. Puppies should not be left alone longer than 2-3 hours and need lots of attention and training to nurture their continued development. So movie night out with the girls or date night with the hubby often have to be put on hold – unless you have doxie sitter OR you plan to take your doxie puppy with you. When I got Rufus I worked from home so I was able to be with him 24/7 and didn’t leave him alone for any significant amount of time until several months later (which was a gradual process). I only had one dachshund for seven years but it worked well because I took Rufus with me everywhere. Rufus has been all over the country (20+ different states) so he was never left at home alone while I worked or did my thing – instead we did OUR THING together. When I got Emily, Rufus was older and honestly not ideal for a young pup but… that was when Milo was a constant in our daily lives and he made getting Emily timely because she had someone with whom to get all that puppy energy out. Puppies are work, but if you’re willing to put in the time you’ll end up a perfect doxie for you. If you think your Lily’s perfect forever family be certain to complete an application on-line. 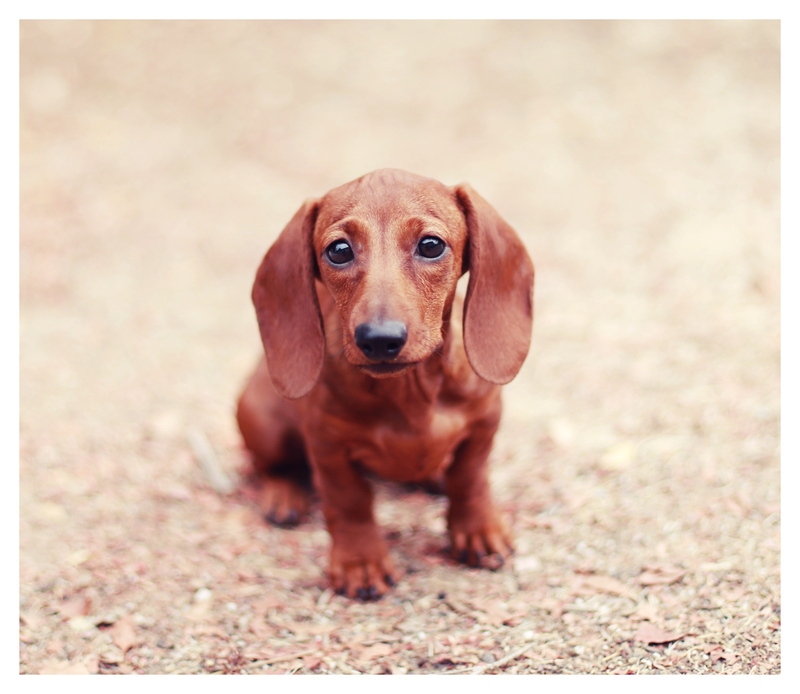 She’s intelligent, spirited and adorable – just like a healthy and happy doxie puppy should be. 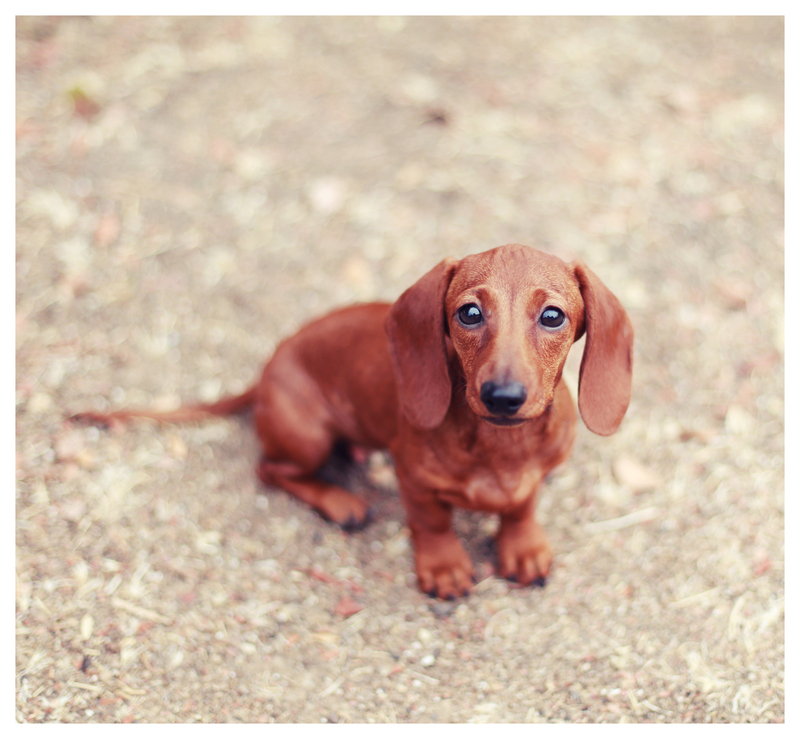 Today’s photos remind me a lot of Rufus’ doxie puppy photo. What do you think?! 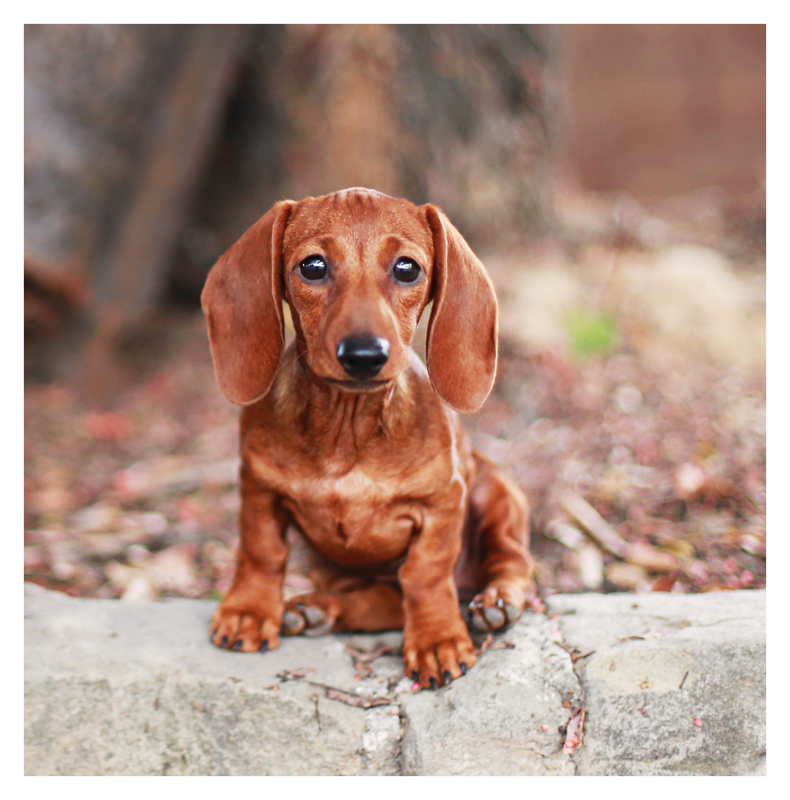 This entry was posted in Rescue and tagged #dachshund, #dachshund puppy, #red dachshund, #rescue, #smooth dachshund, doxies. Bookmark the permalink. Oh, grandma, what big ears you have! And cute worry wrinkles on your forehead! And dramalicious eyebrows & big brown eyes!! The better to make you love me! Oh, my, Lilly is an outstanding example of doxie cuteness & she will always have that puppy face. She’s a heart breaker. I had my Tisha for 17 of her 21 years. Last Satuday lost my Taboo after 14 years. I took her to the vet, had surgery months before. But then a back injury. Several busts to vet recently to save her. Both of my sweeties enjoyed sleeping in my bed with me. I also had Cestie, lived to be 8. Dixie lived to be nearly 10 (developed cancer). Limo (stolen out of my yard when I let him out!!) , Taterbug (also stolen, had a rash of full blood dogs stolen at the time), Big Boy. Right now I have my 2 year old Elvis, pedigree long hair, given to me several months ago. Time fir his check up. My dachshunds are house dogs taken outside by me. I have a very large house fir them to play in and I go outside to watch them play on the cleared out part if my 16 acres. Elvis is wearing out the foot if my bed and grieving the loss if Boo Boo. Until he jumps in the car with me to go to my daughter’s to run her 23 acres (cleared and you can watch him everywhere in the land). My I do just think she is so sweet I have 2 Doxies and a Siberian huskie that is 15 years young. Sadie my 3rd and the love of my life doxie just got sick one week she was fine and 2 weeks later she was gone from a fast growing brain tumor. I miss her sooooo much. I would love to have Lily however right now I am fostering 3 very fun chihaha puppy’s puppies for Foxy Doxie. I will have them for at least another month untill they are ready to be fixed chipped and up for adoption to their forever homes. They are pretty cool for 9 weeks old they are using there pee pads and follow me like little ducks outside to pee and poo as soon as they wake up its very cute. But my heart is with doxies.